The goal and purpose of the Women’s Team Roping Association: WTRA is to provide a competitive association for women that will allow ALL eligible women team ropers to compete within their skill levels for quality prizes. Membership is open to any female team roper that is a California, Oregon or Nevada resident. A membership form must be filled out and submitted with $80.00 dues to any WTRA Officer prior to winnings being eligible for the standings. There are currently four separate leagues in the WTRA; as well as the Heeling League that every member can participate in. The WTRA Leagues are based on the amount of money won the previous year that you were a member of WTRA. Rookie League: Any new WTRA member or any existing member that has not won any money. A girl can move to the B League from the A League based on a two-year consecutive average within the same league. Example 1: If a member won $7,000 one year and $5,000 the next year, her winnings would average $6,000. She would remain in the A League. Example 2: $5,000 one year and $2,000 the next year, average $3,500. She would move to the B League. A girl can move to the C League from the B League based on a two-year consecutive average within the same league. However, a girl cannot go back to the C League if she has ever won a WTRA saddle; if she has ever been in the A League; if her classification number in ACTRA is higher than a 2, or if her USTRC number is higher than a 4. Ropings that are limited to a certain amount of teams will not count if a member is turned away because team limits have been met. That means that if they only accept 100 teams and a WTRA member is turned away because they had 101 teams, money won from that roping would not count for any member. If a member gets to a roping and the amount of money roped for is changed to a smaller amount, the roping will still count. Ropings which are changed to a larger amount and ropings that are added (not advertised) will not count. 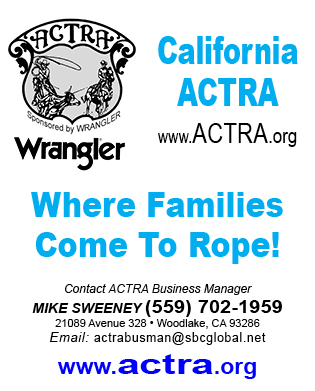 Any Advertised “added” money or prize money offered at an eligible roping will count toward year-end winnings. WTRA Year-End Finals: Money won on the day of WTRA Finals will count that day AND it will carry over plus be doubled for the New Year’s Standings if you stay to rope the following day. If you do not rope the following day, monies won will not carry over and will not be doubled towards the new standings. Monies won on the 2nd day will also count as double toward the new standings. Example: If a girl wins $100 on Saturday and $50 on Sunday, her earnings for the New Year would count as $300. All win sheets must be completely filled out, signed by the arena secretary and postmarked within 14 days of the event when sent to the WTRA Secretary. The Secretary has the right to refuse any win sheet that is not complete or postmarked within the proper dates. WTRA suggests that you keep copies of your win sheets for your own records. – One trailer ad for $300.00 and one book (30 tickets) @ $20 each. The member is financially responsible for the tickets in her possession. All tickets, sold or unsold, must be returned to the WTRA and accounted for or the member will pay value for those tickets. Tickets and monies must be turned in by the end of the 4th go-round of the BFI in order to qualify for the year-end prizes. A member cannot win more than one saddle in the same year. For example: A girl that wins both the heeling league and her league division, can only win one saddle. That means if she chooses the heeling saddle, the other saddle would go to the reserve champion in her league and she would get the reserve buckle or vice versa. The elected officers of the WTRA shall be the President, Vice President, Secretary, Treasurer, and League Directors. These Officers will be elected by the general membership as outlined below and shall make up the executive committee. President: The President will call at least one annual meeting and preside at said meeting. She will oversee all WTRA business and coordinate with other officers in their duties. She will be in charge of arranging and coordinating WTRA finals and awards banquet. She will be in charge of the promotion and recordkeeping of the advertising for the horse trailer raffle fundraiser. Vice President: The Vice President will take over the duties of the President in case of absence or disability. She will keep in contact with the Secretary and promptly report current standings and any other news/information in a monthly newsletter to the membership. She will also provide necessary information to the Ropers Sports News. She will be in charge of coordinating and sending out annual ballots and keeping accurate records of membership votes. She will be in charge of sending out trailer drawing tickets and keeping accurate records of the sales of these tickets. Secretary:The Secretary will keep permanent written records of all meetings. The Secretary is in charge of accepting and keeping accurate and up to date records of each member’s winnings and reporting those standings monthly to the Vice President. Treasurer: The Treasurer is in charge of keeping complete and accurate financial records in permanent form. She will have available, on request, current financial information. She will provide a detailed written report at any meeting. She is in charge of paying all WTRA bills. She is in charge of keeping accurate records of all incomes and sources of incomes. She will manage all banking transactions. League Directors: There will be an A, B, C and Rookie League Director. The League Director’s primary duty is to represent the membership and special needs within their League. She needs to be available to her League for questions and information and share that information with officers. She will help organize ticket sales shifts at the BFI; assist other officers as needed to benefit the association. Please note that this is a complete set of rules at this time. These may be reviewed, modified and voted on as deemed necessary by the WTRA Officers. Membership is easy! Contact Dionna Smith (559) 513-9608. She will mail you a membership form, rules, and a win sheet. OR — download the MEMBERSHIP FORM here and mail it to Dionna with your dues. Her address appears at the bottom of the form. • What ropings count for points? Almost any roping counts. You do not have to rope in just all-girl ropings. Most advertised ropings count, including USTRC ropings. State finals count, but not National finals. California, Arizona, Nevada and Oregon. • Are the WTRA Finals just for women? The WTRA Year-End Finals are open to everyone, male or female. Bring your friends, family and partners! A lot of ropers think that the WTRA Finals are just an all-girl finals. This is false! Anyone is very welcome to rope! • But, I don’t go roping enough to stay in the top 10! In this economy, nobody is going to a lot of ropings! You can stay in the top 10 of your league with very minimal earnings. Sometimes as little as a few dollars. Remember, you are roping against women in your same league for your top 10 awards. You do not have to rope against someone who wins a lot until you are ready to win a lot! This is why we have A, B, C and ROOKIE leagues. These leagues are by money won! • But, women heelers can’t win as much as headers! Heelers have a league of their own. You compete against your heeler peers for top 10 awards. You are also put into your league category (A, B, C or Rookie) based on money won. Heelers have two leagues that they are able to compete in. I was told by someone this year that they felt they had to solicit for their year-end awards! As far as I know, most associations need to charge a membership fee and most associations take a certain percentage out of their ropings that goes to year-end awards and finals costs. Our way of doing the same is to ask that each of our members pay a membership fee and that each member sell 30 tickets, or a sponsor sign for the trailer that we give away at the Bob Feist Invitational in Reno each year. We’ve been doing this for 30 years! A lot of people will ask you for the tickets. At the BFI, the tickets sell rapidly. Girls, you have about 6 months to sell 30 tickets! It’s easy to do!